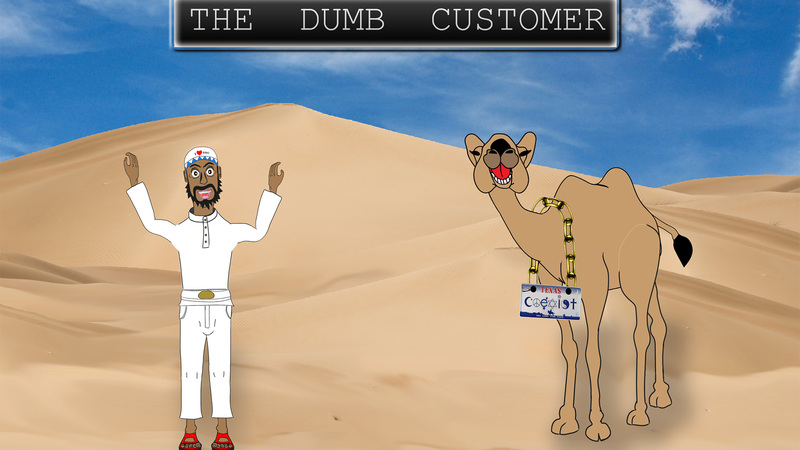 Welcome to the Official Series webpage for our short 2 episode Animated Series entitled “The Dumb Customer” released in 2016! The Dumb Customer is an Animated comedy series based on real customer service calls (edited for comedic value) in which we explore what it would be like for a disabled mute persons to call customer support about everyday products, after all Disabled and mute people need help just as much as the rest of us ! Breaking all the rules of political correctness and stereotypes (in a tongue in cheek fashion) we see what it’s like for characters who can only Communicate through the use of a “TTY System” (teletype and relay system) to resolve our Character’s issues. Our Characters do have a voice ! Play on words, sarcasm, Animation and other comedic and visual elements tell our funny stories. Over the course of the series we intended on developing other characters from different backgrounds all with their own funny experiences and culture ! Born to parents who come from all different backgrounds from the middle east. He is from the beautiful country of Abboudai (ficticious), somewhere in the middle east. Ackmar along with his pet camel “Wally” discover just how strange and funny things can be in the West ! Learning to be a westerner is more challenging than first thought ! Through the use of modern technology and brilliant Artwork we deliver you a cartoon series that will entertain you and make you laugh. Please Comment and Like and Subscribe to our Videos! Due to lack of interest and feedback for the show we have now turned our attention to other ideas. We appreciate any feedback that was given on the series and look forward to hearing from viewers on these 2 episodes. Who knows, we may restart the series if there is enough interest. Please Note: T-Shirts are still available for purchase from our online store ! Get yours today before they disappear forever !